Sputum Mug is a receptacle or other container, made for spitting into. It is widely used in hospitals, nursing homes and other health care centres for different purposes, particularly collection of sputum for laboratory investigations. GPC Medical Limited, internationally known manufacturers and exporters of quality hospital equipment & devices, include Sputum Mugs also in the wide range of Stainless Steel Hospital Hollowware. 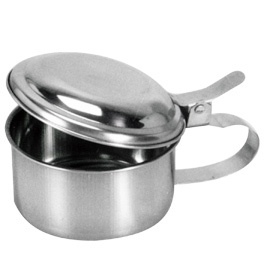 Our Sputum Mugs are made from the finest quality of medical grade stainless steel. They can be autoclaved. They are durable. They are rust and corrosion resistant. Our dedicated technicians ensure that the internationally accepted quality standards are followed in the production of the Sputum Mugs. Our regular Sputum Mugs are round with lid, but they are also produced as per the specific requirements of our valued customers in different countries. Send Your Buy Requirement For "Sputum Mugs" AND Get Quote Quickly.